The "Contacts" section of the Sales module is the place where you can create contacts and to relate these with any Account, Opportunity or Campaign you have created on your SugarCRM CE application. In the next few lines of this tutorial we will provide you with detailed information on how to manage the "Contacts" of your company create in your SugarCRM CE instance. In order to access the page where you will be able to manage the Sales Contacts of your organization you will need to login into your SugarCRM CE instance and then to navigate to Sales > Contacts. 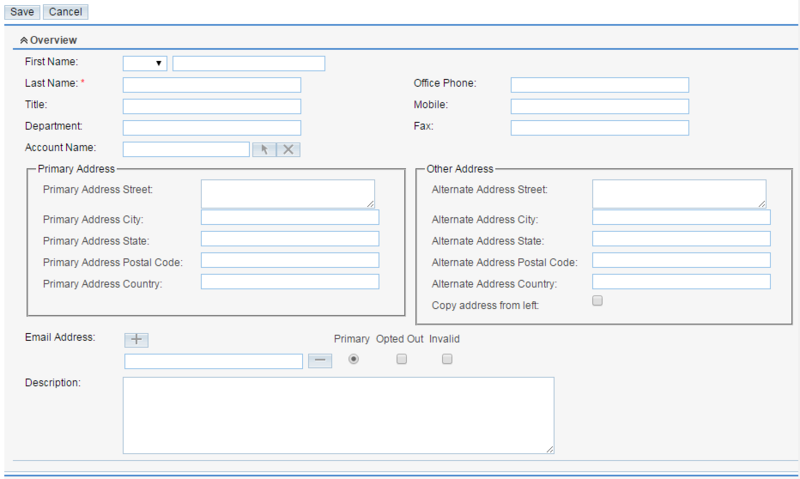 Then you will be redirected to a dedicated page where you will be able to fully manage the Contacts. In order to create a new record in the Contacts of the Sales module you will need to simply click on the Create Contact link at the top Actions bar. Last Name - The last name of the customer. Mobile - The mobile number of the customer. The last section is called "Other" and there you will be able to configure this contact to be assigned to certain employee of your organization. 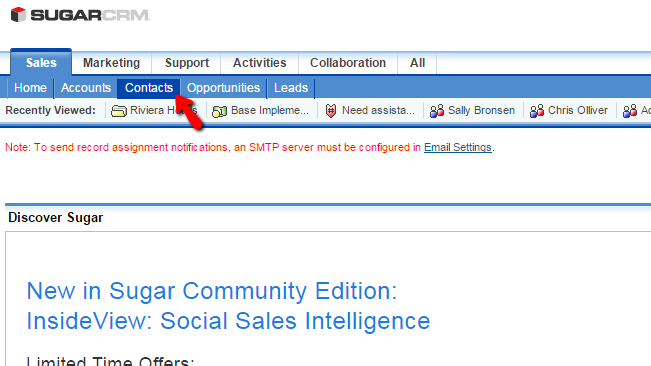 In order to Edit the Contacts of the Sales module you will need to access again the Contacts home page. Then you will need to use the search module to locate the Contact you would like to edit. Then you will need to simply click on the small pencil-like icon before the contact name and you will be presented with the editing interface. It is the same as the one you have used to create a new user, however with the only difference that most of the fields will be filled with information you have already added for that contact. When you are ready simply click on the Save button so the edits for this contact can be saved. The last action we will review related to the management of your Sales Contacts is the deleting of contacts. In order to delete a contact you will need to first and foremost find the contact you would like to delete. You can refer to the Edit action so you can better understand how to search the contacts. Once you have found the contact you would like to delete you will need to select it and to click on the Delete button at the top of the page. Once you do that you will need to confirm the deletion and then the contact will be deleted. Congratulations! You are now fully aware of how the Sales contacts of your SugarCRM CE application can be managed!